This post will be updated with links to our posts on our cruise experience. When you are planning a vacation, there is nothing that can beat opting for a Caribbean cruise. People love the islands of Caribbean because of its weather, water and wonderful shoreline. This made Caribbean number one when it comes to tourist destination among travelers. These series of islands are set in the horizons of the beautiful Caribbean Sea. The chains of Caribbean islands include Bahamas, Jamaica, Aruba, Cayman Islands and Virgin Island. Each of these islands got a small population living in them. .-= caribbean cruise´s last blog ..I’m back! =-. This is a really in depth post of your travels. Thank you very much. I am planning on taking my wife on a cruise for our anniversary next year, and as we will be leaving from Auckland New Zealand the Asian cruises are the most affordable. I will be reading this again before i make any decision. .-= Famil Cruise Deals´s last blog ..A Family Cruise =-. I am happy I discovered this weblog, I couldnt discover any info on this topic matter prior to. I also run a website and if you want to actually severe in a little bit of guest writing for me if feasible feel free of charge to allow me know, i’m always appear for individuals to check out my site. Please stop by and leave a comment sometime! Hi! I saw that Royal Caribbean’s having a $3 room upgrade deal, so I was thinking of booking a trip. Thanks so much for your review! Now I know more or less what to expect (: Your trip looks awesome, by the way! It’s very exiting to find this http://www.passportchop.com website. You sure can write and teach and inspire. Keep writing – I’ll keep reading. It is an engrossing and informatory post. It has been very helpful in understanding of diverse things. I’m sure most people will agree with me. Glad I found yr blog. It is both very interesting and informative! Not to mention great layout too. I just booked a 5N trip w RC on Legend of the sea to Bangkok and am looking for more information. Can you let me know if there are wifi or Internet connection on board? Also how would you rate the on shore tours? I couldn’t find any details on the land tours and their office number is always busy! I know the Bangkok port of call is 100k away from the city so last thing I want is to pay $100+ to spend 3 hs on bus….. There should be more info in the pre-departure cruise booklet they issue you a few weeks before. Some really nice and useful information on this internet site , too I believe the design contains great features. This blog appears to recieve a large ammount of visitors. It gives a nice unique twist on things. I guess having something real or substantial to talk about is the most important factor. What a good submit. I really love reading these kinds or content articles. I can?t wait to view what other people need to say. Nice post. I used to be checking continuously this weblog and I’m impressed! Extremely useful information specially the remaining part 🙂 I maintain such info a lot. I was looking for this particular info for a very long time. Thanks and best of luck. Hey there, was over joyed to find this particular website. Really just found it with aol however I wasnt searching for anything at all linked specifically to this actually, but I liked reading through up on the particular facts you had to say. Kudos! 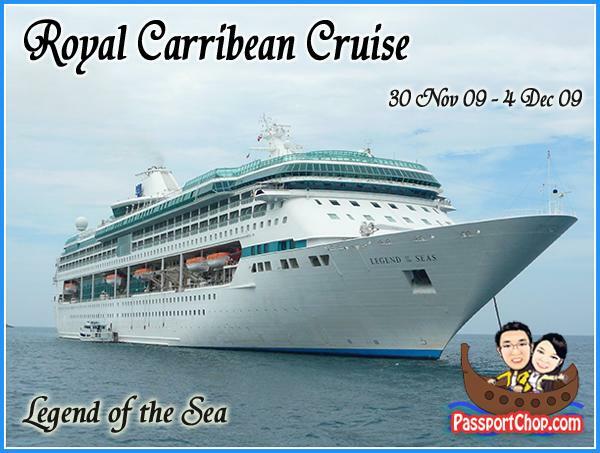 you can go to Royal caribbean Singapore Website for the local travel agent who can arrange this cruise for you.